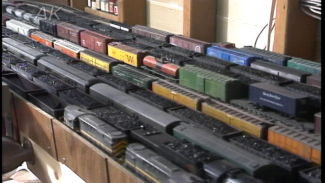 Most model railroaders’ first layouts utilize sectional track of fixed curves and straight pieces. While convenient and easy to install, sectional track is limiting in variety and realism. In this video, learn how laying flex track is easy to do and can take your layout to a whole new level of realistic and reliable track plans. 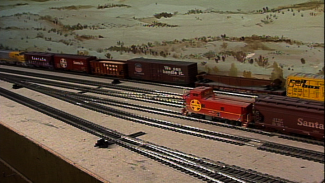 Modeler Jim Kelly shows how HO model train flex track is easily bendable into virtually any desired radius. The secrets, he points out, are that one section of ties is cast in plastic, while the opposite ties are gapped every second tie. The other tip is trying not to locate rail joints in a curve, because they can easily kink or gap causing derailments. First, Jim glues down a cork roadbed in the desired location and pre-planned radius. Next, using an adhesive (Liquid Nails is Jim’s desired glue), he runs a thin bead down the centerline of the roadbed, smooths it out with a putty knife, and lays the flex track, holding it in place with pushpins while it dries. While the glue is still setting, Jim uses a rail nipper to cut off the track ends more evenly, then files the ends smooth so that the rail joiners will slide on smoothly and make good electrical contact. He uses a pliers to slide the rail joiners on the ends, adds another bead of glue on the roadbed, and slides the straight piece of track into position, making sure the ends are properly seated in the rail joiners. Using the pliers again, he slides the joiners evenly over the joints. If you accidently crush or dent the rail joiner in the process, discard it and start over with a new joiner. While laying model railroad flex track is slightly more time-consuming that installing sectional track, the endless variety of curves will make your layout more interesting to view, and allow tracks to be laid in tighter spaces to serve that new industry on your pike. Give it a try! And here are some more tips to help laying flex track with ease. Hi, Terry. I wouldn’t use liquid nails. I would use matte medium. It’s much easier to work with.